Cricket Australia, on Monday, hosted the Australian Cricket Awards night. 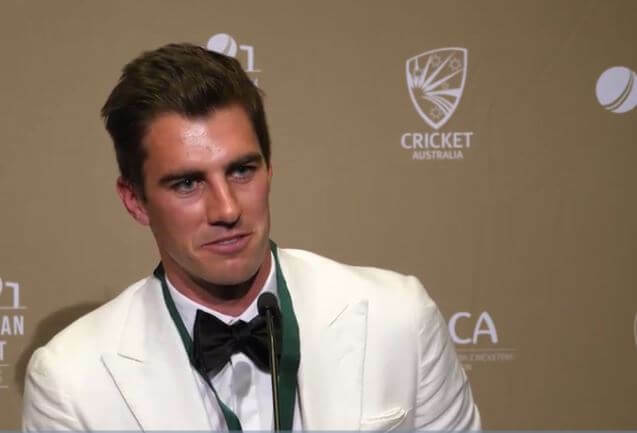 Pat Cummins, who has been the best player of the team throughout the year, won the Allan Border medal after being voted as Australia’s ‘Player of the Year’. The pacer received 156 votes and left behind Nathan Lyon (150), Aaron Finch (146), Usman Khawaja (102) and Marcus Stoinis (102). The voting period was between January 9, 2018, and January 7, 2019. Cummins enjoyed a great time during this period. He took 44 Test wickets to go with 2 half-centuries with the bat. Since 2014, it was the first time that a player other than Steve Smith and David Warner won that award. Among the women’s cricketers, Alyssa Healy won big in the Australian Cricket Awards. She won the Belinda Clark medal for being the best female player of the year. She also won the ODI and the T20 player of the year. Healy scored 329 runs in 6 ODIs at an average of 54.83. She played a pivotal part in Australia’s T20 World Cup victory and was also named the ICC’s T20I Player of the year. Nathan Lyon won the Test player of the year while Glenn Maxwell won the T20I player of the year. Marcus Stoinis was the winner of the ODI player of the year. Three players were also inducted into Australian cricket’s Hall of Fame. They were Dean Jones, Billy Murdoch and Cathryn Fitzpatrick that were honored.